A couple of weeks ago a few of us went north to ride a modified version of the Crazy 88 route. I really wanted to attempt it in one huge push, but other factors came into play that day and I ended up doing it over two days. As soon as I completed that ride I knew I could knock it out in one day, one very long day, but one nontheless. Fast forward to this past weekend and it was time for another go at it. This time I'd cut out a small section of AZT at the top of the equestrian bypass in favor of climbing Sunset Tr to the recently re-opened Little Bear Trail. A few requests were sent out and Steve was the only taker, but Ray decided to join us for the first half of the ride. He is now in taper mode leading up to the official group start of AES's Coconino 250, launch time is this Friday, Oct. 5th. Steve and I will be joining the mix on the 12th, more on that later. We took off Friday after another week of work, stopped in Flag for some sandwiches for our 1/2 way SAG stop during the ride, then made our way up FR556 to the camping spot Seron and I found a few weeks ago. It was cool, borderline cold, outside and the nearby elk were chatting up a storm well into the night! This was going to be my first night out in the chilly night air with my new tent setup, a Tarptent Contrail. So far the handful of overnight bike trips I've been doing have led to a very minuscule amount of actual sleep. I end up just lying there with my eyes closed and rest for long periods of time, hopefully with more experience I'll drift off into a deep sleep one of these trips. The next morning I was also able to give my new stove its first test run and a hot bowl of oatmeal kicked off the day just right. Sunrise from our camping spot. We gathered up our gear, and drove up to the Sunset TH to meet Ray. He started down at the bottom of Shultz Creek giving himself a nice downhill finish for his day. We finally rode out of the parking area around 7:15am and started the mellow 9 mile climb up Waterline Rd. Last time we were up here the heavy machinery was still present, not today! In addition, there was a fresh layer of gravel on the entire stretch, just needs to be packed down a smidge, but otherwise the road is in fine shape. A couple of deer made their way out of the woods onto the road ahead of us, it was nice to see them trotting uphill away from the half dozen or so hunters we passed down below. The top of Waterline Rd. leads to this: the turnoff to the Inner Basin Tr. During the climb the pungent aroma of autumn was all around, the aspens have begun their fiery transformation into a brilliant gold. 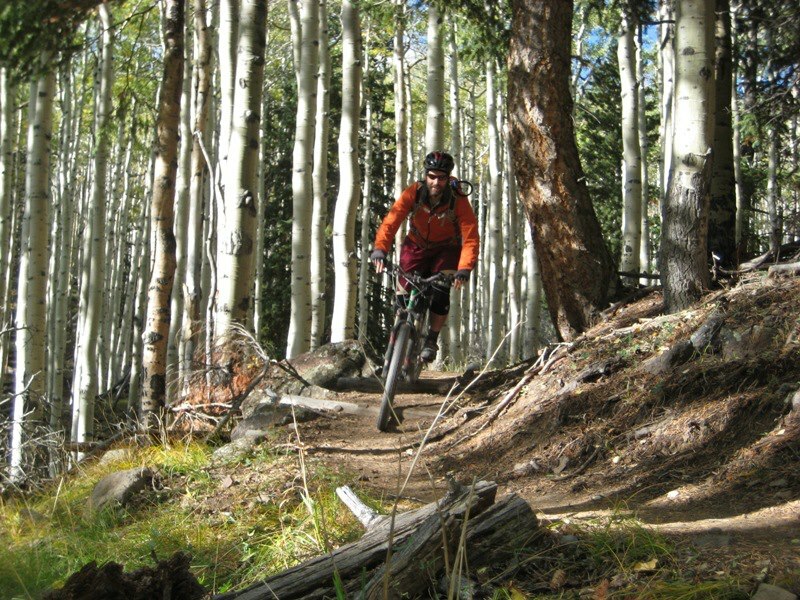 The air was cool, sun was bright and singletrack beckoned us to be shredded. Ok, if we must. Ray captured this shot of me coming down the Inner Basin trail just as a large bug flew into my mouth!! Bleh!! We're famous!! Well, at least our backsides are. Where's Ray?? Northern AZ may not get all the brilliant colors of an eastern fall season, but the golden hues are magnificent. We were up near the thick patch of gold. Nothing better than riding into a postcard. Ray & Steve all smiles and ready for more. I was mentally keeping tabs on the big climbs of the day, sort of a checklist if you will. Waterline Rd. was the longest of the day at 9 miles and was now behind us. Up next were two shorter, but steeper climbs on FR418 leading to the AZT. From there a nicely graded 4.5 mile singletrack climb awaited signaling the end of the climbs for the first half of the day. Ray taking off down FR418. We stopped for a snack at the junction of FR418 & the AZT chatting with a few other riders who were enjoying the perfect weather. I felt good at this point, but could tell I was not able to keep as close to Ray as I did a few weeks earlier. This ride was going to take all I had to finish, but I knew I could do it. Ray captured Steve and I approaching the Bismark Lake turnoff, 4 miles into the climb. 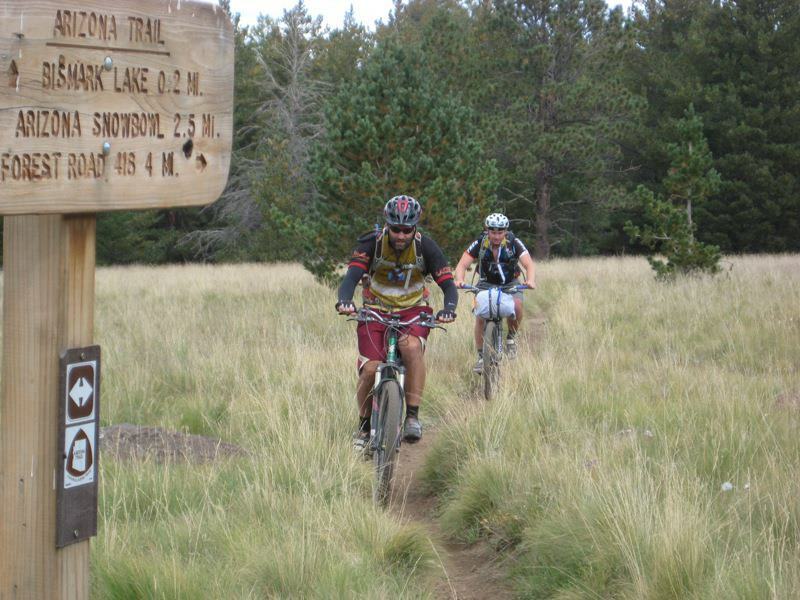 I've said it many times, but the AZT through here is easily in the top 3 of places to ride in the state. 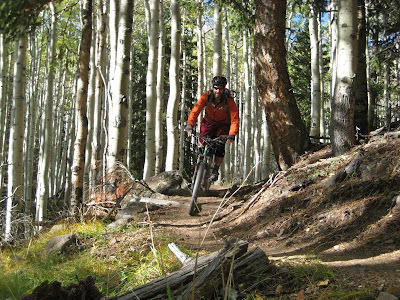 I crested the saddle at the top of the climb and breezed through some flowy downhill sections, a short uphill through an aspen grove, another downhill run and then one more short uphill through an aspen grove before the epic 6 mile descent to Snowbowl Rd. One problem, on the last uphill my left quad cramped up something fierce!! Stopped me dead in my tracks. First time that's ever happened. I think I jinxed myself a week earlier when talking with a co-worker, who frequently gets cramps, how I 'never' get cramps when I ride. Oops. This photo op brought to you by my cramping left quad. Deep blues and golden aspens, aaaahh! Give it another week and the trail will be hard to find. I gave my ailing quad a break, downed some more fluids and a snack, then continued on ready for the massive downhill. We were a bit surprised by the high number of female riders out on the trail, we were easily outnumbered, perhaps even 5:1. Very cool to see a coed mix of riders getting their singletrack stoke on!! We crossed Snowbowl Rd and made our way over the undulating terrain towards the Fort Valley Trail system. We bid farewell to Ray and set our sights on the SAG wagon back at the Sunset TH. Time for my tuna sub from Crystal Creek and a coke!! We re-fueled our bellies, stretched our legs, then began the first of five remaining climbs for the day. A 1.8 mile grunt up Sunset Trail to access Little Bear Trail. WOW! That did not disappoint. I'd gladly trade a couple short HAB sections to ride that trail. Little Bear hugs the side of the mountain, through a burned out section of forest (result from the 2010 Shultz Fire), as it meanders gradually down to its junction with the AZT. We passed a couple of folks on horseback riding up the trail and then another mountain biker making the climb. Not all the forest was burned. Awe inspiring views all around. Waterline Rd. cutting across the mountain. Both old and new, the cycle continues. I narrowly avoided a flight over the bars on the last few hundred yards of trail when my handlebars suddenly cocked 90º to the left during a rock drop, then in a flash they snapped back forward saving my arse from a sure wreck. Whoa, what just happened?!?! Whew. We were near mile 50 at this point closing in on 4pm with 40 miles to go. Time to get moving. 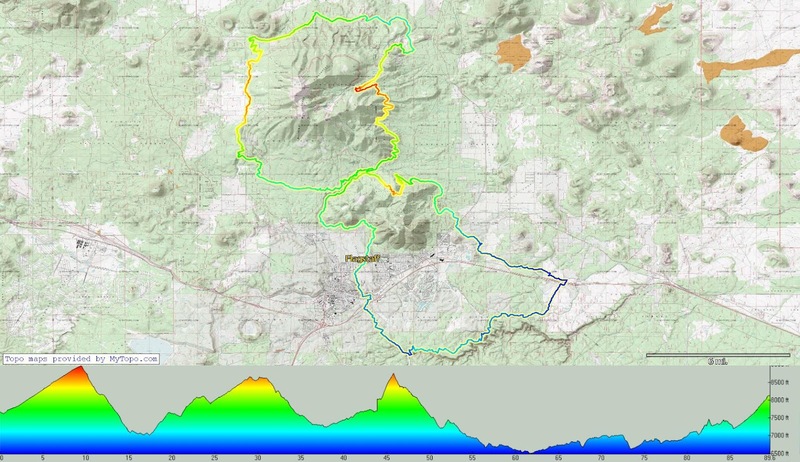 I knew the AZT from here was fast, two of the five climbs were upcoming, but not that long. I wanted to try and make it through the Fisher Point downhill before nightfall. From this point on the camera stayed in my pack, I'll show a couple of pics from the last ride through this area to break up the text. Little Bear junction with the AZT. After completing climb #2, we had to navigate through a sandy 2-track for a short stretch. Always nice to see water on an AZ ride. Easy to miss gate here, the trail splits off a long private drive with little warning. This was the scene only 4 weeks ago, not much color this time. Took another snack break here, approaching the I-40 underpass. Real fast segments near Walnut Canyon. By this point the sun was beginning to set, but I knew we'd make it down & up out of Walnut Canyon before needed the lights. More flowy singletrack leading to Fisher Point. We made it to mile 70 before finally stopping to put on the lights. We almost made it to the Fisher Point descent, but now we'd navigate it under a full moon as well. It's about a 400 foot drop over a mile, nothing super steep, but there are a few ledges and some wicked cool bobsled type turns. Fisher Point, but it was dark and we couldn't see a thing!! At the bottom we made the turn back towards Flagstaff for the home stretch. My chain became increasing annoying with an incessant skipping. It was more just a noise than a performance issue, but it was really starting to bug me. I fiddled with it for a bit, but to no avail. I decided at the next water stop I'd spray it down to get the grime off. Crossing back under I-40 and into Flagstaff. We exited the dirt for some pavement connector miles in Flagstaff. We rounded a corner next to a Taco Bell and just couldn't resist!! We had now been riding for over 12 hours near mile 79 and the thought of some tacos/burritos sounded really good!! I checked in with K to let her know we were still at it & only had 11 miles to go - no problem, right? I squirted water over my chain and all was right again. Let's get moving and back to the car. I really wanted to do a pure AZT route through Flagstaff since my last ride here was detoured due to heavy rain. A couple road miles, then onto a gravel urban trail which took us to Buffalo Park and the final AZT singletrack to Shultz Creek. This guy looks eerie at night. This 4 mile segment of AZT was the only portion of trail I really had no beta about, but I was determined to do the official route. The AZT through here is on the Rocky Ridge trail, remember that name. Not 50 yards into the singletrack I went OTB...oomph!! Ok, it'll smooth out soon. Wrong. Chunky was the name of the game and under the guide of lights at miles 82-86, this was not going to be pretty. The trail then turned upward, HAB. Push, push, push, now some downhill....too chunky - can't pick good lines, HAB. HAB some more, then push, push, push upward again. Is this going to get better? Still 2.2 miles until Shultz Creek!! More HAB ensued and finally after 2 1/2 hours we emerged at the Shultz Creek TH. Yikes, that took forever!! Steve had enough and opted for the forest road climb. I was sticking to my guns & went with the trail climb. Shultz Creek isn't steep, but it's 4 miles long. I really didn't feel all that bad, but my power meter inside was low and any short burst needed resulted in a quick HAB session. It took me about an hour to get up to the Sunset TH & the car, it was 11:05pm. I leaned my bike against a tree, turned around and saw Steve some rolling in, we were done!! We did it after all, woohoo!! Time for a chocolate milk & coffee because we still had to drive home!! 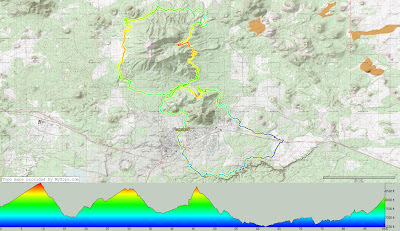 Route for the day with elevation profile. Thanks for tagging along, Steve, on a truly epic day in the saddle. My longest single day ride to date. Ray, it's always good to ride with you, you push me to go faster, get stronger. You are a beast on that SS!! If anyone does the lower loop, do yourself a favor and skip the Rocky Ridge trail!! Maybe it's more fun during daylight hours on fresh legs, but boy is that a tough one. Thanks for taking the time to post this and contributing to the body of knowledge. I found it helpful in planing my upcoming trip today AZ. Glad you found it useful. Hope you had a great time out there.